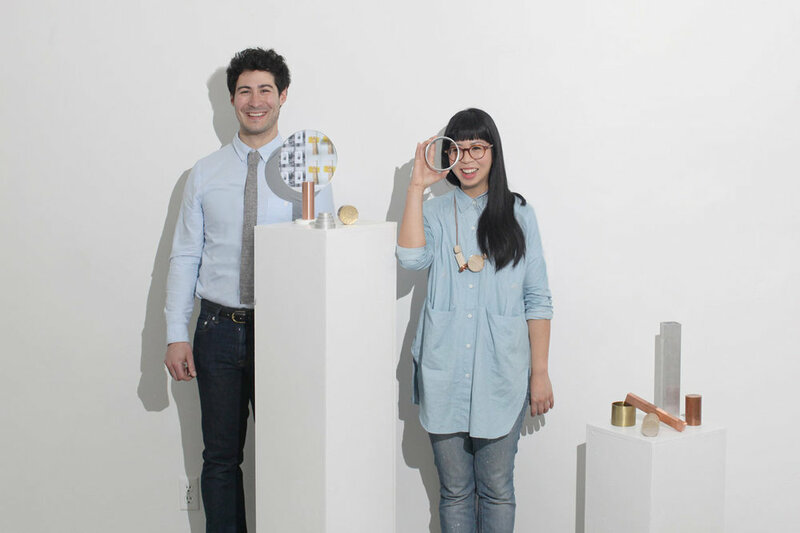 Ladies & Gentlemen Studio's Dylan Davis and Jean Lee focus on designs that are both playful and beautifully made. Dylan Davis and Jean Lee are the designers behind Ladies & Gentlemen Studio (L&G Studio). Formed in 2010 and working between Seattle and Brooklyn, the duo balances what they describe as an aesthetic that warms up minimalism, has fun with austerity and pares back sophistication across furniture, lighting, objects, jewellery and interiors. You will recognise Ladies & Gentlemen Studio's work for New York's boutique lighting group, Roll & Hill, where their Shape Up and Kasimir collections are inspired by artists including the 20th century Russian modernist Kaezimir Malevich and his abstract, monochromatic paintings. And this year they collaborated with the Australian brand SP01 on their first major interior installation for Over/Under NYC that launched at ICFF. A series of large-scale hanging sculptures explore material, shape and balance. L&G Studio is based in Red Hook, a former maritime neighbourhood in Brooklyn and now one of New York's emerging artisan communities. The studio is surrounded by metal workers, furniture makers and glass blowers, and a mix of distilleries, wineries, chocolate makers and artist's studios. Amongst this thriving creative precinct, Davis and Lee are evolving a design approach focused on curiosity and ideas across the disciplines, producing pieces that are both functional and playful, artful and utilitarian, and focused on craftsmanship and finessing the way finely tuned materials can go together. Highlights from the range include the Ovis Lounge Chair series and the Point-Counterpoint Mobiles. 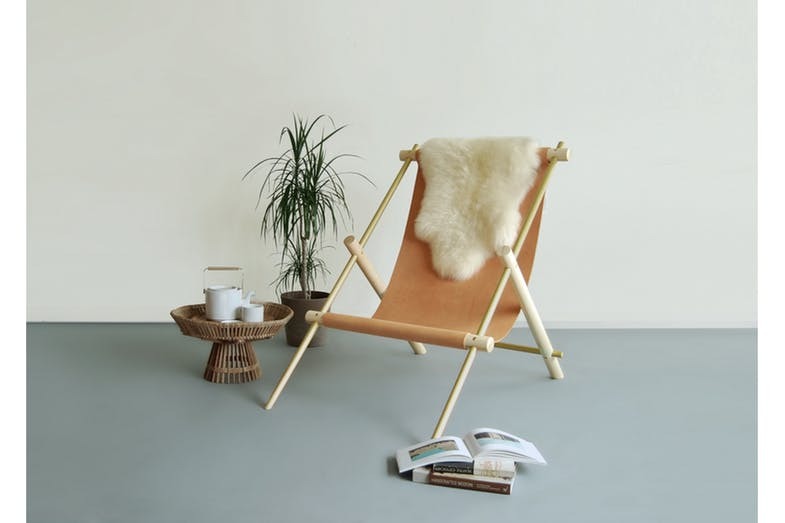 The Ovis Lounge chair is a reinterpretation of the classic sling chair that goes back to 1970s Italy, or even further back to Le Corbusier's LC1 designed in 1928. The Ovis Lounge chair highlights craftsmanship in imanufacture and beauty in natural finishes. The Ovis collection combines materials to make the most of their innate quality, highlighting the craftsmanship in imanufacture and the beauty in natural finishes. Adding fun to the range, there is also a hanging version, with both pieces made from metal and a maple timber frame. The saddle leather seat will develop its own patina over time, while a pure wool version is hand-felted by local textile artist Ashley Helvey. L&C Studio's Point-Counterpoint Mobile A, B & C is an exercise in material and movement. Exploring their interest in the kinetic, for Lee and Davis the Point-Counterpoint Mobile A, B & C, was designed as a series of large-scale hanging sculptures exploring materials, shape, balance and movement in space. Crafted from custom-machined fittings made in their Red Hook studio, each mobile is an edition piece with its own unique selection of material finishes. As the designer/artisan studio model builds momentum in creative communities around the world, L&G Studio's small-scale, high quality offerings across furniture, lighting and objects are gaining traction for the entrepreneurial designers who have taken on the role of designer, producer, and marketer, with some exciting results. The Ladies & Gentlemen Studio mobile studio is now available from Space – Australia.